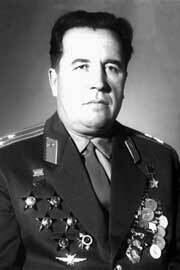 The flight crew for these records were Tupolev Design Bureau senior test pilot Colonel Ivan Moiseevich Sukhomlin, Pilot, and Colonel Boris Mikhailovich Timoshok, Co-Pilot, and four others. These are the fastest speed records ever established for any propeller-driven airplane. The records were retired by the FAI due to changes in rules. The record-setting Tu-114 was the second production airliner. The Tupolev Tu-114 Rossiya was a four-engine, turboprop-powered airliner developed from the Tu-95 Bear nuclear-capable long-range heavy bomber. It had a flight crew of five, two pilots, a navigator and two flight engineers, and could be configured to carry from 120 to 220 passengers, or 30,000 kilograms of cargo. 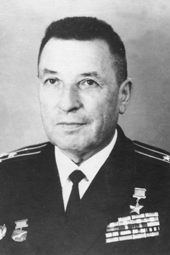 The Tu-114 made its first flight 15 November 1957 under the command of Colonel Alexei Petrovich Yakimov, and began regular service with Aeroflot 24 April 1961. The Tu-114 is 54.10 meters (177 feet, 6 inches) long, with a wingspan of 51.10 meters (167 feet, 8 inches) and overall height of 15.50 meters (50 feet, 10 inches). The wings are swept aft to 35° at ¼-chord, and they have significant anhedral. Total wing area is 311.1 square meters (3,348.7 square feet). The airliner’s empty weight is 93,500 kilograms (42,411 pounds) and maximum takeoff weight is 179,000 kilograms (81,193 pounds). 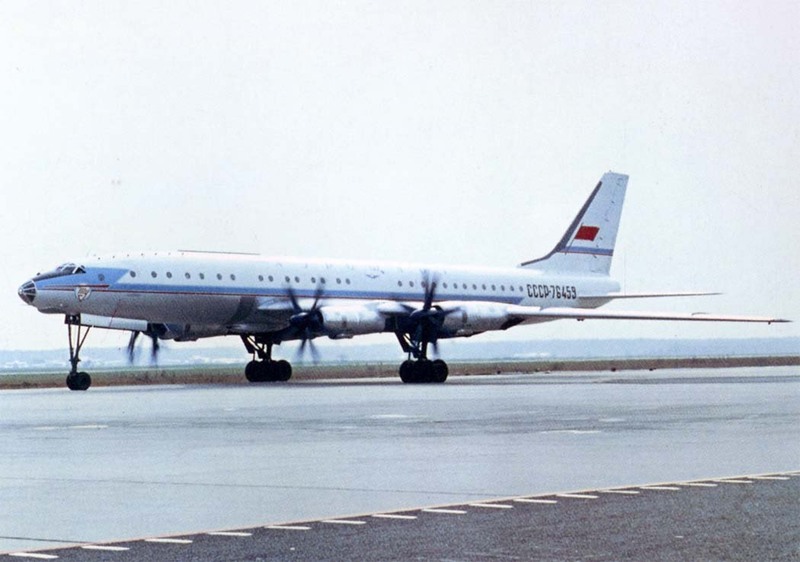 The Tu-114 was powered by four Kuznetsov NK-12MV turboprop engines, each driving two counter-rotating four-bladed propellers. The NK-12 was rated at 14,795 shaft horsepower (10.89 megawwatts). The NK-12 is a single-shaft axial-flow turbpprop engine with a 14-stage compressor section and 5-stage turbine. The engine is 19 feet, 8.2 inches (6.000 meters) long, 3 feet, 11.3 inches (1.151 meters) in diameter, and weighs 5,181 pounds (2,350 kilograms). The Tu-114 had a cruise speed of 770 kilometers per hour (478 miles per hour) at 9,000 meters (29,528 feet) (0.70 Mach), and a maximum speed of 894 kilometers per hour (556 miles per hour) at 8,000 meters (26,247 feet) (0.80 Mach). The airliner has a practical range of 7,000 kilometers (4,350 miles) and maximum ferry range of 8,800 kilometers (5,468 miles). The service ceiling as 12,000 meters (39,370 feet). 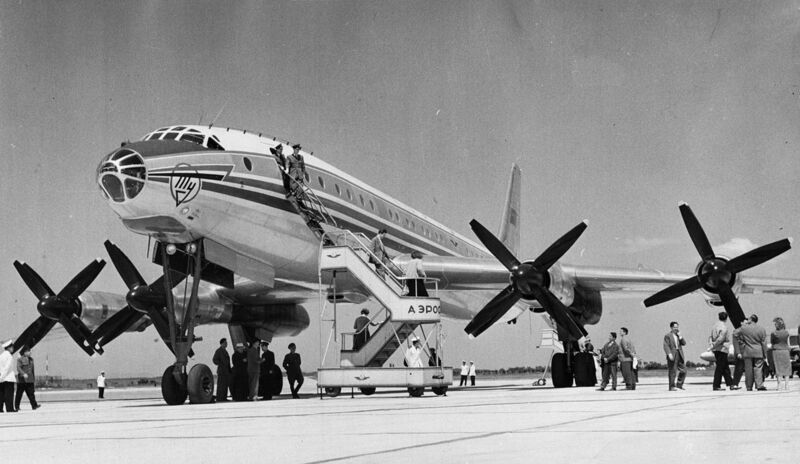 The Tupolev Tu-114 was produced from 1958 to 1963, with 32 built. They were in service until 1976. 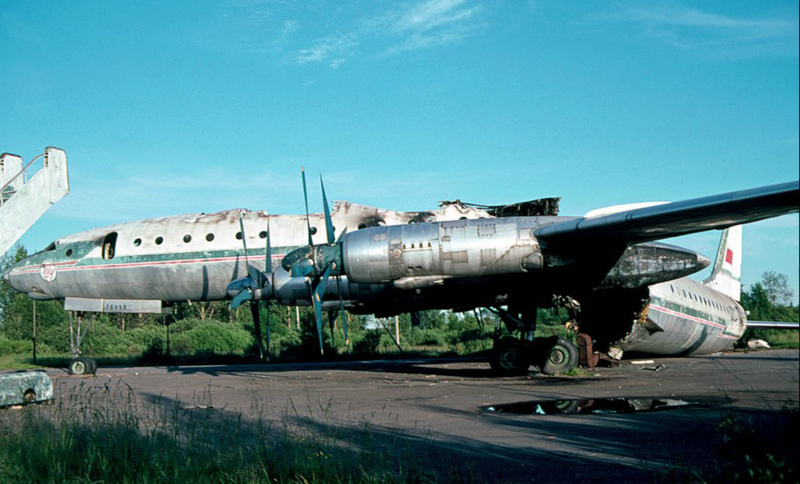 CCCP-76459, the world-record-setting airliner, was displayed at Novogorod Airport, Veliky Novogorod, Russia, in 1977. It was destroyed by fire in 1990. ¹ The Sternberg Point Observatory, also known as the Sternberg Astronomical Institute (Государственный астрономический институт имени Штернберга), is located in Moscow, Russia. I’d love to see a comparison of the TU-114 with the Constellation. Size, engines, operating envelope, pe4formance, everything.